The new Roman Catholic Bishop for the diocese of East Anglia, who previously served as a Church of England priest, has been installed. The Right Reverend Alan Hopes, 69, was welcomed at the West Door of the Catholic cathedral in Norwich before the two-hour Mass of Installation. 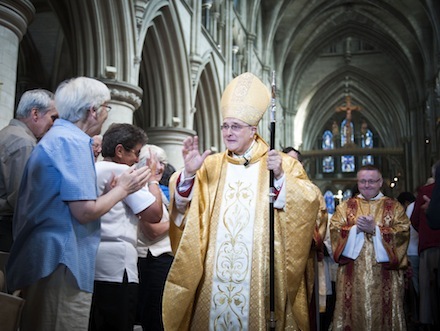 Bishop Alan will lead Roman Catholics in Norfolk, Suffolk and Cambridgeshire. He succeeds the Right Reverend Michael Evans, who died of cancer in 2011. The cathedral was at full capacity of nearly 2,000 people to witness the ceremony led by Archbishop Vincent Nichols of Westminster. Bishop Hopes was born in Oxford in 1944 and moved to London with his parents in 1956 when he attended Enfield Grammar School. He read for a degree in theology at King's College in London and was ordained an Anglican priest in 1968. He was received into the Catholic Church in 1994 and was ordained a priest a year later serving in parishes in Kensington and Chelsea. Ordained an auxiliary bishop for the Archdiocese of Westminster in 2003 he became chairman for the department clergy and consecrated life. At the installation Bishop Hopes said the people of East Anglia had waited a long time for a new bishop.